Here's the first of another series which I'm excited about. I often see and read Daily Makeup posts and thought as I enjoy these posts I would post something similar. 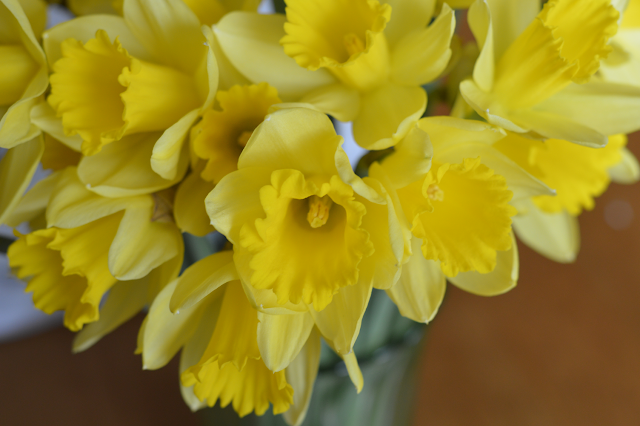 With Spring creeping around the corner I had to add the beautiful daffodils in this post. The sun is slowly but surely peeking out more and more each day and when it does boy does it make a difference to my mood! 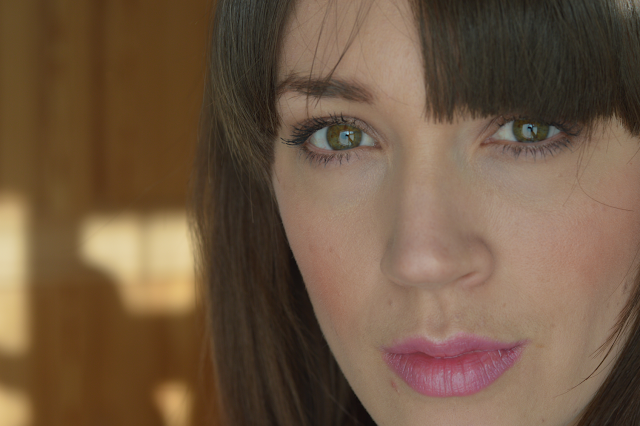 I've even swapped my lipsticks around and opted for more spring shades with a bright shade here and there. Following on from my recent review of the PUR Minerals 4-in-1 Pressed Mineral Powder I've been reaching for this daily, so it had to be featured here. If I'm looking for super coverage I use this over the top of my liquid foundation. I did try the PUR Minerals Chisel flat top brush but didn't favour it much, so I dug out my trusty bdellium Tools Flat Top Kabuki brush instead. And I'm happy to report this works perfectly. On my cheeks I have MAC Stereo Rose msf, a beautiful warm coral shade with gold veining. 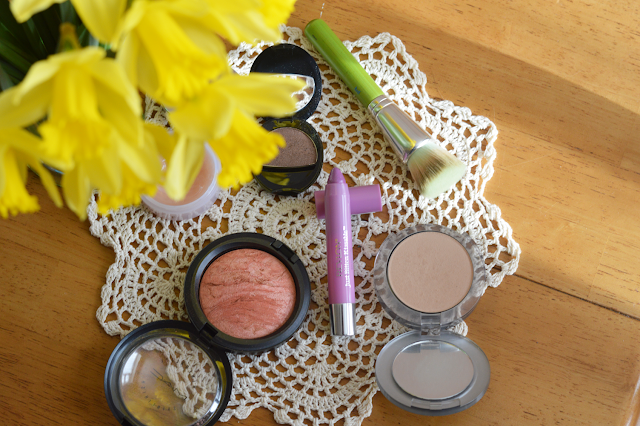 Works great as a blush and a highlight, but does need a little tlc when applying it. I tend to apply it with my Mac169 and then use a big fluffy face brush over the top to buff the shade in. On the eyes I'm wearing No7 single eyeshadow in Truffle, this is a gorgeous rich brown shade with a satin finish. The shade really compliments green eyes and I imagine it would look stunning on blue eyes. 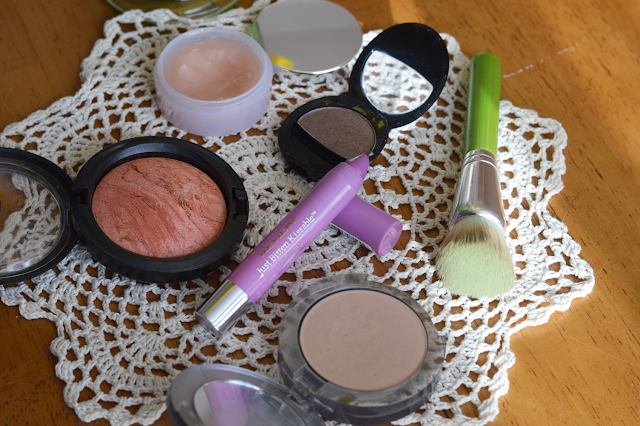 This is a one-lid shadow which buffs easily into the socket for a softer effect. I normally pop a little under the lower lashes. Lastly for the lips I popped on some Glam Balm LIP by Rodial, it smells divine and you literally need a dab of this. I wait a minute or two for my lips to drink up the balm and then apply my lipstick which happens to be one of the Revlon Just Bitten Kissable Lip balms. I was drawn to the shade- Darling. This shade reminds me of spring, I couldn't help myself what with the beautiful daffodils. I recently got a chunky blunt fringe cut in and am slowly learning the ways of a fringe. Blimey is it high maintence and I can not stop touching it!!! Thank god for dry shampoo...ha ha! Love your fringe! !And how fresh you look doll! !